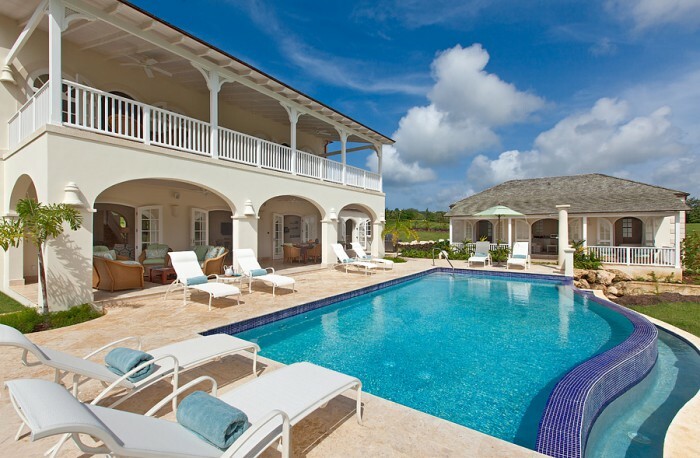 Tradewinds is an impressive four bedroom villa with views across the immaculately groomed Robert Trent Jones Jr designed golf course, blending seamlessly into the Caribbean Sea. Set within manicured gardens that are filled with tropical shrubs and flowering trees, Tradewinds offers excellent outdoor spaces for relaxing and entertaining. The grand entrance of the property leads into a cool, coral stone interior. The flowing open plan design of the living and dining room provides sophisticated comfort, including a 50” Smart TV, DVD player and a wireless Sonos system so you can enjoy your own music. The dining table with upholstered chairs comfortably seats eight. Two double French doors open on to the patio that spans the entire width of the villa, embracing tropical outdoor living in true Caribbean style. The patio, which overlooks the swimming pool and the secluded garden, is furnished with comfortable oversized chairs and features a dining table for alfresco dining. Two bedrooms are on the main level, one with a queen-size bed and ensuite bathroom and the other with a king-size bed and ensuite bathroom with shower. This bedroom opens on to a private terrace with views of the sea. The professionally appointed and contemporary all stainless steel kitchen is an Epicurean’s dream. The adjacent covered outdoor terrace is ideal for casual dining and includes a built in gas barbecue and hob cooking facility. At the rear of the kitchen is an office space and there is complimentary Wi-Fi throughout. Two spacious master suites are upstairs, both with Imperial sized beds and ensuite bathrooms, one with a bathtub and shower and the other with a shower only. Both of these bedrooms open onto the large private balcony where you can sit back, put your feet up and enjoy breathtaking views and magnificent sunsets. ~ Resort privileges to include access to the world-class golf course, floodlit tennis courts, excellent gym & fitness centre, Clubhouse, resort pool, dining facilities at the Members Only Club House, and access to the exclusive members only Mullins Bay beach club just 5 minutes drive away. There is a Resort Fee of US$20 per day which will be paid directly by the guests to Royal Westmoreland when collecting the Resort passes. Please note that Tradewinds in a non-smoking villa, and children 12 years and older are welcome. This private residence on the desirable Ocean Drive avenue of the Royal Westmoreland Golf Resort is perfect for the golf or tennis enthusiast, with views of the 13th fairway and onward to the western coastline, resort privileges include gym, tennis, beach facility on Mullins Beach. For the golf, tennis and fitness enthusiast this prestigious colonial style villa sits on an elevated position in the exclusive Royal Westmoreland Resort, with stunning golf course and sea views and access to the resort's gym, tennis courts and members' beach facility on Mullins Beach with a free shuttle service.